Rockland, Maine, September 7, 2018 — The Center for Maine Contemporary Art (CMCA) is partnering with For Freedoms, a national platform founded by artists Hank Willis Thomas and Eric Gottesman that uses art as a vehicle to build greater participation in American Democracy. Timed to coincide with the Camden International Film Festival, beginning on Thursday, September 13, CMCA and For Freedoms will present a full-scale, temporary billboard installation by acclaimed artist and writer Christopher Myers in CMCA’s public courtyard at 21 Winter Street, Rockland. Entitled “Every Refugee Boat is a Mayflower,” Myers’s installation speaks to the growing international refugee crisis and current issues on migration. Based in New York City, Myers is an award-winning writer and illustrator of young-adult literature, whose artistic practice is equally rooted in his storytelling and interest in global affairs. Myers has long been interested in language and globalization. For his project, “I Am Not a Human Being,” he worked in collaboration with Vietnamese embroiders to create images inspired by Lil Wayne songs, and his project Vxllrncgnt deals with the colonial history of flags made by the Fante people of Ghana. His film collaboration with For Freedoms founder Hank Willis Thomas, “Am I Going Too Fast?,” addresses the rapid rise of technology in Kenya and premiered at Sundance. The installation, “Every Refugee Boat is a Mayflower,” will remain on view at CMCA through Sunday, October 14, 2018. During its final weekend on Saturday, October 13, it will be coupled with an immersive pop-up virtual reality installation Making Migration Visible | A Shared Space by Camden-based artist and filmmaker Daniel Quintanilla, that brings the viewer inside the homes and shared spaces of recent Maine immigrants Shuab Ahmed Mahat and Hilowle Aden, who grew up in Dabaab, Kenya, the largest refugee camp in the world, and who now call Lewiston, Maine, home. Since 2016, For Freedoms has produced exhibitions, town hall meetings, billboards and public art across the United States to spur greater participation in civic life. Inspired by American artist Norman Rockwell’s paintings of Franklin D. Roosevelt’s Four Freedoms (1941)—freedom of speech, freedom of worship, freedom from want, and freedom from fear— For Freedoms uses art to encourage and deepen public explorations of freedom in the 21st century. This year, For Freedoms launched The 50 State Initiative, a new phase of programming running from September through December 2018, during the lead-up to the midterm elections. Centered on the vital work of artists, the exhibitions and related projects of The 50 State Initiative model how arts institutions can become civic forums for action and discussion of values, place, and patriotism. For additional information on the partnership with For Freedoms and other exhibitions at CMCA, please visit cmcanow.org. Located in the heart of downtown Rockland’s burgeoning arts district, CMCA is Maine’s leading contemporary art center, presenting a year-round schedule of exhibitions and educational programs for the community. Summer hours: Monday – Saturday 10am-5pm; Sunday 12-5pm. Closed Federal Holidays. Admission is $8; $6 for seniors and students with ID; free for CMCA members and visitors under 18. For more information, please visit cmcanow.org. 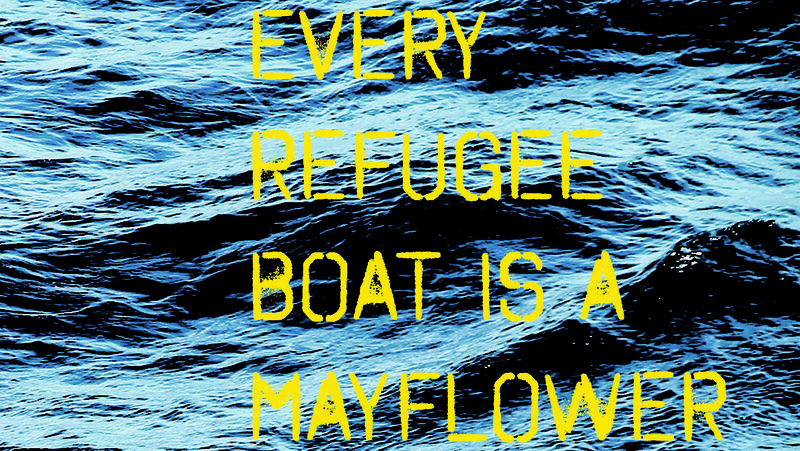 Image: For Freedoms billboard, “Every Refugee Boat Is A Mayflower,” 2018, Christopher Myers.